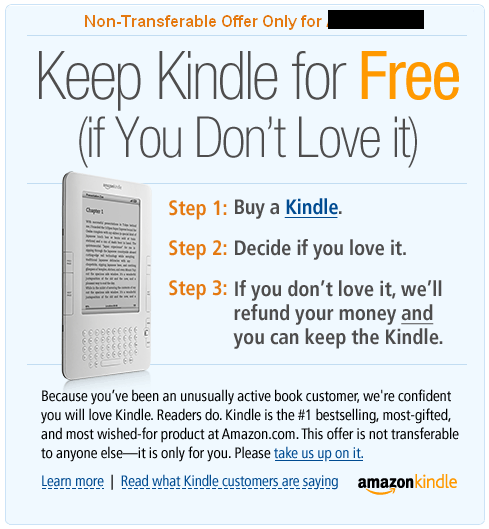 Hesitant about ordering an Amazon Kindle? 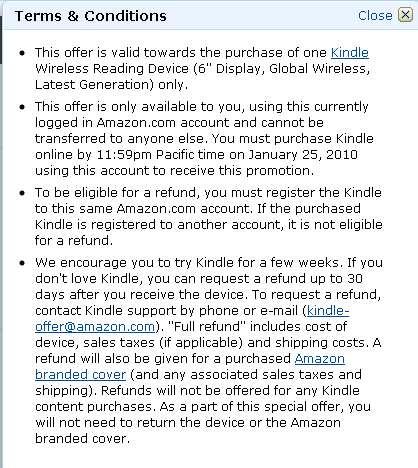 The online retailer is apparently making a very tempting proposition to some of its customers: go ahead and order a Kindle, and if you don’t like it, you’ll get your money back — and get to keep the device. In other words, if you’re not satisfied you’ll get a free Kindle (and an Amazon-branded cover). Talk about putting your money where your mouth is. Commenter Vladimir Cole has listed how many books he typically orders from Amazon (it sounds like he averages more than a book a week). Commenter Alex L says that he sees it too. He’s only ordered a total of around 20 books in the last three years (most of which were last year). Our original tipster says that he orders perhaps a couple of books per month and has been a member since 1997. Assuming it is real, it’s pretty clear that this is only being offered on a limited scale right now — the promotion points out that the user who saw it is an “unusually active book customer” and the deal is non-transferable. It’s also obviously designed to entice these users to make impulse buys, as the promotion ends in only five days. Also worth pointing out: the promotion ends just over a day before Apple’s upcoming event. Perhaps Amazon is looking to grab any book-loving holdouts before the Tablet lands? To those who can get the offer, it looks like you’ll have 30 days to make up your mind. Amazon isn’t making it excessively easy to make your money back — you’ll have to actually Email or call their support staff. Assuming the promotion is real, I suspect it will work out in Amazon’s favor. They’ve almost certainly done market research showing that bibliophiles love the device, and how likely these users are to request a refund.